An entire one acre property in the heart of Historic Town. In his will of May 16, 1805, William Hackett left to his son, Henry, "a lot of land in Centreville which I purchased of Joseph H. Nicholson, Esquire and in which I am now erecting a new building containing one acre . . ."
Since that time, owners have included the Richard Tilghman Earles, Philip T. Davidsons, Madison Browns and the Dr. James Bordleys. Interestingly, Dr. Bordley was the fifth generation of physicians bearing the same name although this Dr. Bordley styled himself as "Dr. James Bordley, Jr."
A newspaper nailed under a floorboard revealed that the porches and other modifications were made in 1907. The rear wing was added in 1840 and enlarged in about 1850. Front porch replaced an earlier, smaller porch - 1891-1903. Rarely does one find the dignity of this fine brick residence situated on a ONE-acre urban lot. 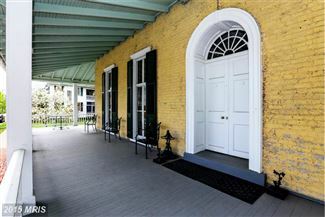 The Bordley House is at the center of historic Centreville's history beginning about 1805. The quiet grandeur of this building is pronounced. the many fully restored (and lined) fireplaces, original floors, inviting porches on both first and second levels, high ceilings, fine woodwork and mantel emphasizes its importance in architectural history.
" The interior is laid out with a side passage double parlour plan.The passage extends the full depth across the north end of the house. The overall width of the passage is ten feet but the double stair extends 3'7" into that space along most of the north wall. This stair is one of the most unusual in the county. It rises from both ends of the passage to a landing at the center of the north wall. These straight runs then join, turn 90 degrees and rise an additional six steps to the second floor passage. This transverse section stair is positioned above an elliptical arch, combined with the stair, create a highly ornamental effect." There are four commodious bedrooms - all with handsome fireplace. The master bedroom enjoys views of the ground from the double -tiered rear porches. Centreville is a swift distance from Annapolis, Washington and, to the North, Chestertown which is home to Washington College. BWI airport is just an hour drive.